Roadworks are ongoing this week at Ballypollard Road in Magheramorne. A safety barrier is being erected on an elevated bend at the north end of the road near its junction with the main Shore Road. Further along the road, drainage work near Smithytown has been taking place and is now completing. There has been a welcome recently for a new 40mph zone introduced betweenBeltoy Road and Tongue Loanen in Eden. 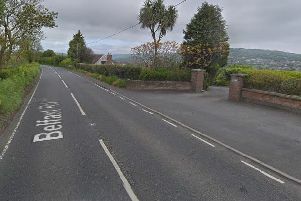 Meanwhile, Ulster Unionist councillor Mark McKinty is calling for Mid and East Antrim Borough Council to formally name the Black Hayshed Road, in Ballycarry, which has never had a sign erected. Councillor McKinty who has the backing of the village community group says the local identity should be preserved through a street sign for the route.